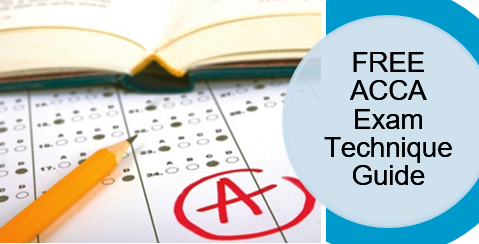 ACCA students who are falling below the pass mark of 50% are usually struggling due to a lack of examination technique. Completing a professional qualification like ACCA requires a rounded skill set, so you need to understand the theory, be able to apply in the exam BUT also have the right technique so you maximise your marks. Nick Best from Astranti Financial Training has put together a 37 page guide on How to Improve your ACCA Exam Technique – which could see your next ACCA exam mark increase by 40%! Exam’s are difficult for a multitude of reasons. Nerves can play a part (although a small amount of nerves can be a good thing to keep you alert!) but they are difficult to control. So the one thing YOU can control is how you approach your next ACCA exam and what technique you will apply. Do you find yourself facing these issues below? Comfortable with the ACCA syllabus theory but still fail to pass the exam? Filling your exam answer scripts but scoring less than 50%? Running out of time in the exam hall? Fear not, you will be in the same boat as thousands of other ACCA students. That’s why we recommend you read Nick’s ACCA Exam Technique Guide to help you avoid making the same mistakes exam after exam. What can you expect from the guide? Using a previous ACCA student as a case study, it will explain how he his ACCA exam score jumped from 29% to 69% by following the advice. Explains the benefits of why you should plan your answers. The 6 stages involved in planning your answers – starting from understanding the requirements to brainstorming your answer plans. The 10 key rules you should follow for writing excellent answers, this will stop all of the unnecessary waffle that students tend to write by not understanding the requirement of the question! Calculation questions and how to score the easy marks even if you don’t reach the final correct answer. A look at ACCA Computer Bases exams and what technique should be applied here. Once you have read the ACCA Exam Technique guide and put the methods into practice you should be well on your way to passing your next ACCA exam. Here is a video from ACCA on how YOU should prepare for the Exam Day. The ACCA F6 Taxation paper comes in different formats depending in which region you are studying, this is down to the different taxation rules that apply in different countries so be sure to check which location you are selecting when getting your study materials and entering the exam. For example, based on the UK tax system, below are the areas of the syllabus you will cover when sitting the F6 paper. You can find the full F6 syllabus and study guide from ACCA here. For those students who register with Astranti, you can access the free online version of the F6 Taxation study text here. Astranti offer members their free study texts for ALL levels of the ACCA and it’s a great way to compliment your exisiting study materials or to use them as a base for your ACCA studies. ACCA and BPP have put their heads together and produced an excellent video series on how to pass ACCA exams. The below video goes the F6 Taxation paper and gives your tips and techniques on how to the pass first time. A very useful video for those sitting the exam for the first time. ACCA students who do not have the benefit of classroom tuition with one of the big learning providers will benefit from the Astranti ACCA Masterclasses. It’s a great revision tool that covers the whole syllabus area of the F6 paper and gives you the tools you need to be able to answer the questions on exam day. You will also pick up invaluable tips on how to approach the exam and pick up the easy marks. The masterclasses are spread over two days and will contain over 10 hours of learning material. As always, mock exams are the perfect way to prepare for any exam and the ACCA F6 taxation paper is no different. Astranti offer past exam papers for F6 Taxation with marking and detailed feedback to see where you went wrong. The ACCA also provide plenty of mock exam resources for the F6 Taxation paper here. Passing your ACCA exams first time needn’t be as tough as you imagine. With the right preparation, study materials and revision behind you then there is no reason to achieve top marks in your next exam. The December 2016 ACCA exam sittings are rapidly approaching and students who are taking exams then should be well on their way with question practice and looking to cement the knowledge they have already learnt. You can find details below of ACCA revision classes that are scheduled just before the December exam sittings. It’s the perfect timing to confirm the knowledge you have already gained and be EXAM READY and pass first time. The exams begin on Monday 5th December with the F8 Audit and Assurance paper and will conclude on Friday 9th December with the F4 Corporate and Business paper – you can see the full schedule of exam dates below. Alternatively you can find the full schedule for 2016 ACCA exams on their website here. Having the right study plan is key to passing ACCA exams and the following revision masterclasses are timed perfectly for those students sitting exams in September. The two day classes are live sessions hosted by a qualified tutor and are packed full of tips on how to pass ACCA papers. The master classes are available on all ACCA skills, essentials and options papers ranging from F5 all the way to P7. Find the paper you are sitting below and follow the link to find out more information on the master classes.